Let’s get one thing straight right now: Neil Armstrong was not a liar. But that’s the outrageous accusation made about him in screaming headlines following a new BBC documentary on his life. 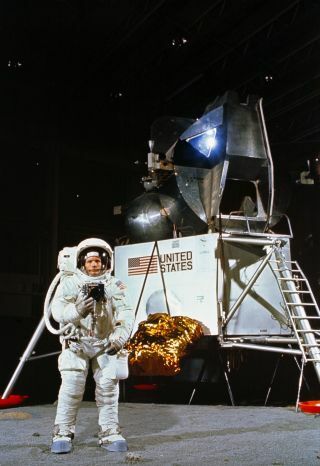 The controversy stems from a comment made by Armstrong’s brother Dean, who says in the film that Neil shared his famous "one small step" quotation with him shortly before the mission. The problem, in some people’s minds, is that this seems to conflict with Neil’s own statements over the last 40 years about when and where he composed what became an immortal sentence when he took his first step onto the moon. So let's look at the facts. "I did think about it. It was not extemporaneous, neither was it planned. It evolved during the conduct of the flight and I decided what the words would be while we were on the lunar surface just prior to leaving the LM." In the Aug. 22, 1969, issue of LIFE magazine, Armstrong elaborated a bit more. "I had thought about that a little before the flight," he wrote, "mainly because so many people had made such a big point of it. I had also thought about it a little on the way to the moon, but not much. It wasn't until after landing that I made up my mind what to say." This is the story Neil told me when I interviewed him in 1988 for my book "A Man on the Moon" (even though I did not specifically ask the question, knowing he was probably tired of answering it). It was also the story Armstrong told his biographer James Hansen in 2003. It is simply not true, as several recent news articles have claimed, that Armstrong always said he composed the quote "spontaneously." It would have been completely out of character for Armstrong, who was thoughtful about nearly everything he said and did, to have offered such an important quote without thinking it through beforehand. Nothing in Neil’s post-flight statements rules out the possibility that he thought up the "one small step" line before leaving Earth. He didn’t say "I thought up the quote after we landed;" he said, "I decided what I would say after we landed." Dean Armstrong's story just adds a little ambiguity. Maybe Neil had more than one quote in mind at that point, and only shared one of them with his brother. Or maybe the quote he showed his brother was an early draft, but after all these years, Dean remembers seeing the final version. We'll probably never know the answer. What it does not mean is that somehow Armstrong "fibbed" or "lied" to the public for 40 years. Everyone who knew Neil well has described him as extraordinarily principled. That was certainly the man I saw when I interviewed him, and in the years that followed, as we became friends. And it's worth remembering that Neil Armstrong went to the moon, above all, as a consummate engineering test pilot. As he told me in 1988, making the first lunar landing was the greatest technical challenge, and before the flight, he thought he and Buzz Aldrin had only a 50-50 chance of pulling it off. Stepping onto the surface was far less central in his focus, and coming up with a quote for the first step was way down on his list of priorities when faced with the awesome challenge of his mission. And yet, he understood its importance, and he gave us a quote worthy of the moment, one that will live forever. And that’s the point: Neil Armstrong did right by history. And now we should do right by him.